Parentage and birth: She comes from a religiously oriented family of Surinam. She is the youngest daughter of Shri Kesarinath Ramdas Pandey and Shrimati ChandraKali. She was born in 1974, in Surinam South America. She is the youngest among the ten children in the family and was brought up in Holland, Europe. Academics: She did her M.A in psychology from the Rijks University in Leiden, Holland. Samskaras and further developments: She exhibited devotional Samskaras right from her very young age. She was very eager to know and learn about the Hinduism and its scriptures and she strongly felt the need of a Guru for it. Before she met Guruji she had dreams about him. She heard that there was a Brahmrishi Mission Ashram in The Hague, Holland, which was teaching Hinduism and its scriptures. Also that saints from India were coming there and teaching. In 1993 she went to the Ashram for the first time and met Brahmvadini Shri Krishna Kanta Ji Maharaj and in her guidance she joined the Ashram and actively participated in all its activities - spiritual and others. In 1995 she had first Darshan of His Holiness Shri Gurudevji Maharaj. She was very much impressed by His Divine message and highly scientific based philosophy, which totally changed her life. She decided to dedicate her life completely in the lotus feet of Shri Gurudevji Maharaj. In 1996, Guruji told her to wear white clothes, gave her the name Haripriya and instructed her to do some spiritual practices. In India: She came to India in 1998. She studied Sanskrit, Ramayana, Gita, Upanishads and Yoga Practice and Philosophy etc., under the tutelage of Guruji. Also, she continued her spiritual practices. In Canada: She came to Canada in May, 2001, to assist Swami Chaitanya Jyotiji in meeting the growing needs of the Ashram. She loves her like a mother for guidance. She could thus smoothly align herself with the religious, cultural and temple activities. She now conducts independently classes in Sanskrit, Philosophy, Yoga & Meditation, Bal Vihar and Vegetarian Cooking. She conducts Yoga Camps for children. She assists in organizing yoga camps for adults and activities on special/auspicious occasions. She also assists in the management of BMC. She imbibed the Mission's doctrine � service with love and wisdom. With her selfless, loving and caring nature, she has thus endeared herself with the community. Her aim is to spread the message and ideology of the Shri Gurudevji Maharaj accordingly. 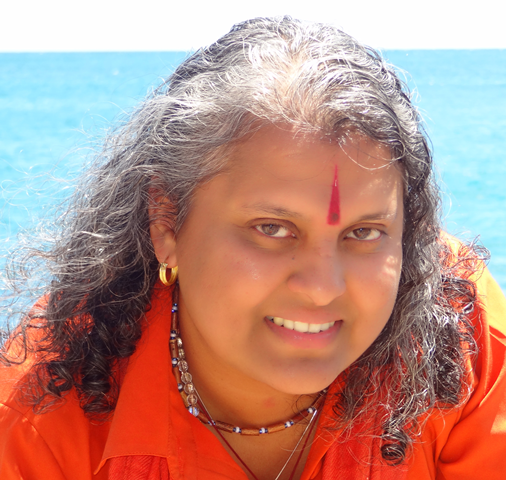 Sanyasa: Guruji decided to initiate her into Sanyasa in April 2002. It could, however, be not possible then because Guruji left his body in February 2002. She has now been initiated into Sanyasa on February 6, 2004, on Magh Purnima at Neel Dhara, Haridwar by Brahmvadini Shri Krishna Kantaji Maharaj, with all the other Mission Sanyasins witnessing the ceremony. In closing: Let me have a chance to express my heart-felt feeling. The Kathopanishad declares this path - sanyasa - ksurasya dhara nisita duratayaya durgam pathastat kavayo vadanti - like the sharp edge of a razor is that path, so say the sages, difficult to tread and hard to cross. It is only men and women of highest grit, firmness of mind and faith, considering the invaluable reward of self-realization -over everything worldly -dare to put their foot in it. Haripriyaji you have proved to be one of them and joined the band of the Bold dedicated Sanyasins of the Brahmrishi Mission. With your selfless service and dedication, you have achieved - the rarest to achieve - the divine grace of the Lord and Guru, and endeared your self with the community here. In the Brahmrishi Mission of Canada, presently, under the guidance of an accomplished Sanyasin � Holiness Swami Chaitanya Jyoti ji � there is a large field of operation for you to spread the teaching of Sanatan Dharma, for which the great Master Shri Vishvatma Bawra ji Maharaj was committed till the very last breath of his glorious life. May the Lord and Guru be always with you in this noble endeavor. With our personal affections, regards and heartiest congratulations for a very well earned holy Sanyasa. Hari om Tat Sat!